For couples planning their big day this year or next, the subtropical island chain of the Florida Keys is the perfect choice for a destination wedding or honeymoon as the sun shines almost year-round. Wedding parties and honeymooners alike can savour their time spent in the Keys. They have the option of staying in a luxury oceanfront resort or restored historic guest house, or even in an intimate island retreat – and in 2019, they’ll find a whole range of new properties to choose from. Honeymooners in the Keys can enjoy a diverse array of distinctive activities. Unique offerings include sunset sailing on a tall ship, planting coral underwater and mingling with flamingos. Plus, a variety of libation and food experiences are becoming increasingly popular for wedding parties. In Key Largo, the new adults-only Bungalows Key Largo, a 12-acre 135-unit ‘luxury inclusive’ resort, is the Keys’ first all-inclusive resort. Amenities include Zen Garden Spa, two in-ground pools, a fitness Tiki hut, 1,000 feet of shoreline, three piers to accommodate 40-foot-long boats; 800-square-foot bungalows; and 4,000 square feet of indoor and outdoor event space. Dining venues include Bogie & Bacall’s, Sea Señor, Fish Tales and a food truck, while two on-site bars can satisfy thirsty customers. Rates include golf cart pick-up and drop-off service, lodging, food and premium beverages, amenities and water toys, and on-site activities. The Florida Keys’ only Curio Collection by Hilton property is the new 200-room, 13-acre Baker’s Cay Resort in Key Largo. The resort features 12 venues with 25,000 square feet for weddings of up to 400 people, a 4,000-square-foot ballroom and 7,000-square-foot lawn. Marathon’s 24-acre, 199-unit Isla Bella Beach Resort, located oceanside, adjacent to the iconic Seven Mile Bridge, is scheduled to open in April. It offers a 4,000-square-foot spa with five treatment rooms and treatments for bridal parties and flower girls; spa lounge and couples’ massage room. 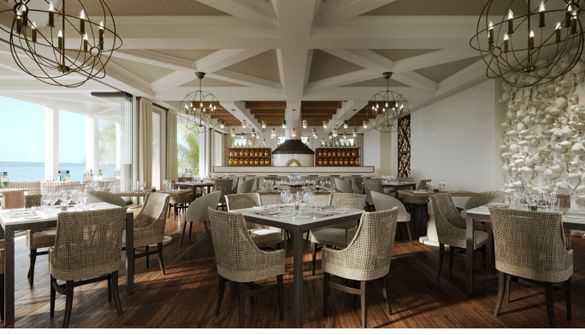 The resort has more than 24,000 square feet of event space including a 4,000-square-foot Hibiscus Center for weddings and anniversary celebrations, five pools, four food and beverage concepts, a full-service marina and a sunset pier. Dining venues include Il Postino, a Neapolitan-style Italian restaurant; The Beach Bar; The Burger Palace and Manatee Bay Marketplace, a waterfront cafe with shopping. Bocce, croquet, oversized chess, complimentary bicycles, on-site water sports and guided fishing expeditions are among available activities. The resort is also to feature two custom MOKE beach cruisers that can be creatively incorporated into weddings and events on the property. At Islamorada’s Aquaholic Adventures at the Postcard Inn Beach Resort and Marina, water lovers can participate in ‘Sip and SUP’ eco-tour experiences. The intriguingly named tour features paddle boarding and kayaking through Key Largo and Islamorada while enjoying libations from local bars. The company’s motto is ‘Paddling Makes Every Hour HAPPY HOUR,’ and personalised paddleboard and kayak tours can be arranged. Group discounts are available for night, dolphin and ‘Sip and SUP’ tours. And romantic sunset tours are ideal for couples in love. The 32-passenger When and If, a historic wooden schooner, has returned to the Keys for the season through mid-May, operating out of Stock Island Marina Village on Stock Island in the Lower Keys. Passengers can step aboard the classic vessel for day or sunset sails or private charters – perfect for a wedding group. At the Key West Butterfly & Nature Conservatory, honeymooners can ‘Flamingle’ with the two resident pink flamingos during daily hour-long encounters. The conservatory is the only butterfly facility in the United States housing flamingos. Groups of four to six can get up close and personal during the exclusive experience. Human participants sit in a white gazebo overlooking the pond and lushly planted conservatory, while the flamingos, Rhett and Scarlett, walk free and interact as they choose. Participants are not allowed to touch the flamingos, but are encouraged to communicate and socialise with them. Islamorada Distilling has been launched by Islamorada Beer Co. Distilling on-site branded gin, vodka, and dark barrel-aged and spiced rums. Spirits tastings are offered daily. The 450-square-foot distillery also has a 400-square-foot gift shop and tasting room. Key West First Legal Rum Distillery offers complimentary mojito-making classes and tastings every Monday to Saturday at 4:30 p.m. Distillery owner Paul Menta recently sailed to Havana to learn secrets of an authentic mojito. Friends can also blend and label a celebratory bottle of rum (reservations are required). New locally made treats include rum Key lime and rum coconut Key lime pies and rum cakes. The three-hour Craft Cocktail Crawl is a new offering from Key West Food Tours. Couples will receive Key West signature drinks including a Hemingway daiquiri, locally brewed beer and a margarita. Three food pairings include tastings and a complimentary food tour booklet, with coupons and recommended eateries. The tour visits Mary’s Ellen’s Bar & Restaurant, The Saint Hotel, First Flight Brewery, Tiki House and Agave 308 tequila bar. Want to make an authentic Key lime pie? Classes at the Key West Key Lime Pie Co. teach participants to do just that. ‘Students’ create mini-Key lime pies of graham cracker crust, Key lime filling and whipped topping. The tangy treat, linked to Key West’s history, was made by spongers and fishermen on board their vessels with simple ingredients that didn’t require refrigeration. Classes take place in a live kitchen at 511 Greene St.